Michael James Barnett was born on August 8, 1840, in Fulton County Illinois. Margaret Jane Knowles (known as Jane to her husband) was born on August 4, 1844, in Menard County Illinois. 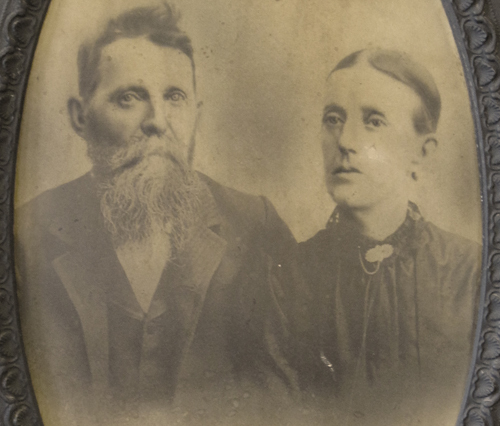 They married in Menard County on April 7, 1864, while Michael James was on leave from the Union Army. Michael James and Margaret Jane both died in Fremont, Nebraska; he on March 11, 1920, and she on February 13, 1926. Both are buried in Ridge Cemetery in Fremont. He was the second child and older son of William C. Barnett (born 1814 in Virginia) and his wife Asenith Killian (born 1815 in Kentucky); they moved to Illinois in 1830. Both of them had ancestors who had lived in America for at least several generations. For more on Michael James Barnett's life and times, click on one of the links below. Michael James Barnett kept a diary during 1865, the last year of the five that he was in the Union Army. The diary was handed down to a son, William R. Barnett, a grandson, C. C. Barnett, and a great-granddaughter, Catherine (Barnett) Garrels Wiley. Recently, Mrs. Wiley's daughter, Linda (Garrels) Mullen, had the diary professionally scanned, transcribed the entries, and added some references and other comments. Great-great-grandson Gordon R. Morgan, son of Margaret (Barnett) Morgan, reformatted the transcription and added some more comments and references. The diary entry for July 25 describes hearing of the Great Magazine Explosion in Mobile. The magazine (a storage facility for 200 tons of ammunition and gunpowder) exploded with such devastating force that much of the city was leveled and several hundred people died. Michael James Barnett was over 160 miles away at the time, but the explosion was so great that news about it spread immediately. Linda Mullen provided links to articles about it; those links, and a summary, appear here.